"It is quite clear that if brother rises against brother, it means that people’s eyes and hearts have grown dull." 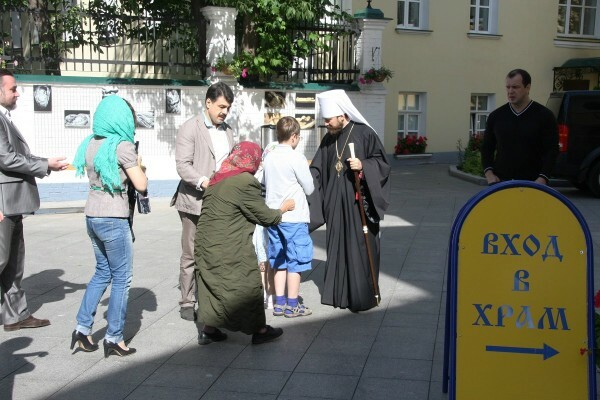 On June 22, the commemoration day of All the Saints Who Shone in the Russian Land, Metropolitan Hilarion of Volokolamsk, head of the Moscow Patriarchate’s department for external church relations, celebrated the Divine Liturgy in the church of Our Lady the Joy to All the Afflicted-in-Bolshaya-Ordynka, Moscow. Before the Litany of Fervent Supplication, Metropolitan Hilarion lifted up a prayer for peace in Ukraine. Following the Prayer after Communion, the Rev. Yevgeny Tremaskin read out the Message of His Holiness Patriarch Kirill of Moscow and All Russia on the Continued Fratricidal War in Ukraine. Metropolitan Hilarion addressed the congregation, speaking about the Day of All Saints Who Shone Forth in the Russian Land as a special day in the life of the multinational Russian Church, “which is a special spiritual space uniting people living in various cities and countries. Speaking about saints of the Russian land, we mean the great assembly of saints of the historical Russia venerated by the Ukrainian Orthodox Church as an integral part of the Moscow Patriarchate and the saints who shone forth in the lands of Byelorussia, Moldavia, Baltic countries, Central Asia, China and Japan – in all the places where the Russian Orthodox Church carried out her ministry and salvific sowing”. His Eminence also addressed the situation in Ukraine, saying “Blood is being spit in Ukraine. Every day brings reports about new victims and a great number of the wounded, those who have become roofless, and refugees. We can have different views of the causes of this confrontation but for us as Orthodox it is quite clear that if brother rises against brother, it means that people’s eyes and hearts have grown dull. That is why a special fervent prayer is needed so that this confrontation may be stopped and all those on whom the fate of the Ukrainian state and people depends may think above all about the need to save people’s lives, not about some momentary political interests”. He asked the congregation to pray to God “so that He may show mercy for our holy Russian Church and the strife may be appeased and peace may come to reign in our land through the intercession of all saints who shone forth in our land”.